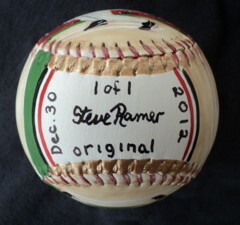 This Legends Hand Painted 3000 Hits Baseball features four of my original paintings of the 3000 hit club. 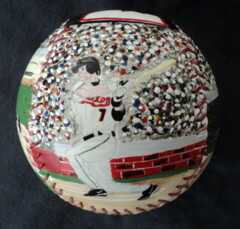 Side one is my action painting of Craig Biggio who finished with 3,060 hits. Click here for a closer look. Side two has my painting of Al Kaline who collected 3,007 hits. Click here for a closer look. 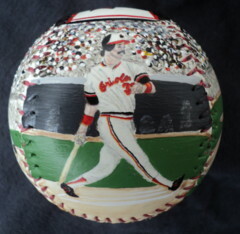 Side three has my painting of Eddie Murray who smacked 3,255 hits. Click here for a closer look. 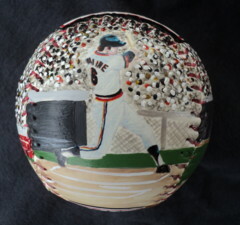 Side four is my action painting of Willie Mays who totalled 3,283 hits. Click here for a closer look. 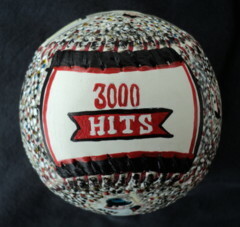 Side five, which is the top of the baseball, has has my hand painted "3000 Hits". 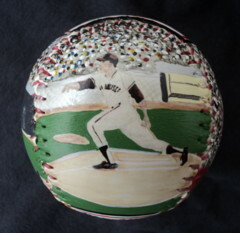 Side six, which is the bottom of the baseball, has my signature along with the date that this Legends Hand Painted Baseball was completed and trimmed with platinum. Also you will see "1 of 1". This means that this is number one of only one created. This is a one of a kind piece of art. There will never be another exactly like it.